The Tyrrhenian border of the Italian peninsula has been the site of intense magmatism from Pliocene to recent times. Although calc-alkaline, potassic and ultrapotassic volcanism overlaps in space and time, a decrease of alkaline character in time and space (southward) is observed. 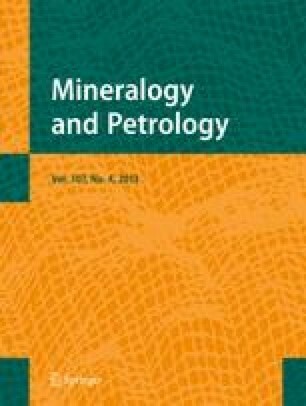 Alkaline ultrapotassic and potassic volcanic rocks are characterised by variable enrichment in K and incompatible elements, coupled with consistently high LILE/HFSE values, similar to those of calc-alkaline volcanic rocks from the nearby Aeolian arc. On the basis of mineralogy and major and trace element chemistry two different arrays can be recognised among primitive rocks; a silica saturated trend, which resulted in formation of leucite-free mafic rocks, and a silica undersaturated trend, charactrerised by leucite-bearing rocks. Initial 87Sr/86Sr and 143Nd/144Nd values of Italian ultrapotassic and potassic mafic rocks range from 0.70506 to 0.71672 and from 0.51173 to 0.51273, respectively. 206Pb/204Pb values range between 18.50 and 19.15, 207Pb/204Pb values range between 15.63 and 15.70, and 208Pb/204Pb values range between 38.35 and 39.20. The general εSr vs. εNd array, along with crustal lead isotopic values, clearly indicates that a continental crustal component has played an important role in the genesis of these magmas. The main question is where this continental crustal component has been acquired by the magmas. Volcanological and petrologic data indicate continental crustal contamination to be a leading process along with fractional crystallisation and magma mixing. Considering, however, only the samples thought to represent primary magmas, which have been in equilibrium with their mantle source, a clearer picture emerges. A large variation of εSr vs. εNd is still observed, with εSr from −2 to +180 and εNd from + 2 to −12. A bifurcation of this array is observed in the samples that plot in the lower right quadrant, with mafic leucite-bearing Roman Province rocks buffered at εSr = + 100 whereas the mafic leucite-free potassic and ultrapotassic rocks point to strongly radiogenic Sr compositions. We may argue that mafic leucite-bearing Roman Province rocks point to εSr and εNd values similar to those of Miocene carbonate sediments whereas mafic leucite-free potassic and ultrapotassic rocks point to a silicate upper crust end-member. Lead isotopes plot well inside the field of island arcs, overlapping the values of pelagic sediments as well, but bifurcation between the samples north and south of Rome is observed. The main characteristic for the mantle source of Italian potassic and ultrapotassic magmas is the clear upper crustal signature acquired prior to partial melting through metasomatic agents released by the subducted slab. In addition, one lithospheric mantle source in the north and an asthenospheric mantle source, pointing to an HIMU reservoir, in the south were recognised. The chemical and isotopic differences observed between the northern and southern sectors of the magmatic region were possibly due to the presence of a carbonate-rich component in the crustal enriching agent in the south. One crustal component might have been generated by melting of silicate metasedimentary rocks or sediments from an ancient subducted slab. The second one might reflect the activity of mostly CO2-rich fluid released more recently by the incipient subduction of carbonate sedimentary rocks.